“Jobs Without Barriers” is a nationwide competition, where users can blog about how they used innovative thinking to overcome a barrier in their lives. Users vote for their favorite contestant; who will be awarded an internship by Nissan, USA. Over a six-month period, the winner has the opportunity to try out positions within various areas of the company: sales, marketing engineering, production and finance. 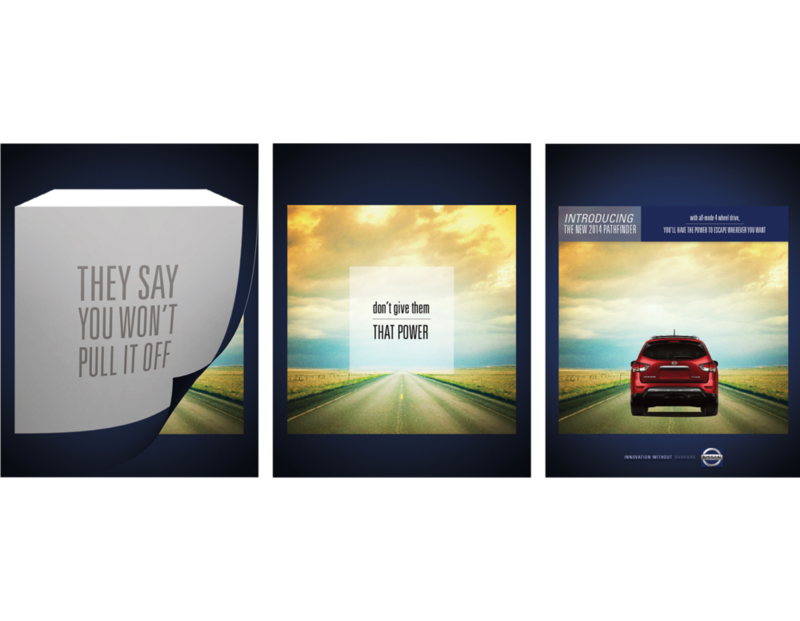 Each week, the winner uploads a video to Nissan’s microsite, Twitter and Facebook feeds allowing viewers to keep tabs on the winner’s progress. “Jobs Without Barriers” lets viewers see Nissan at work and become acquainted with the variety of people and experiences within the company. At the end of the six months, Nissan decides where the worker’s skills will be most useful and offers them a permanent position. Multicultural Millennials trust word-of-mouth more than traditional advertising. 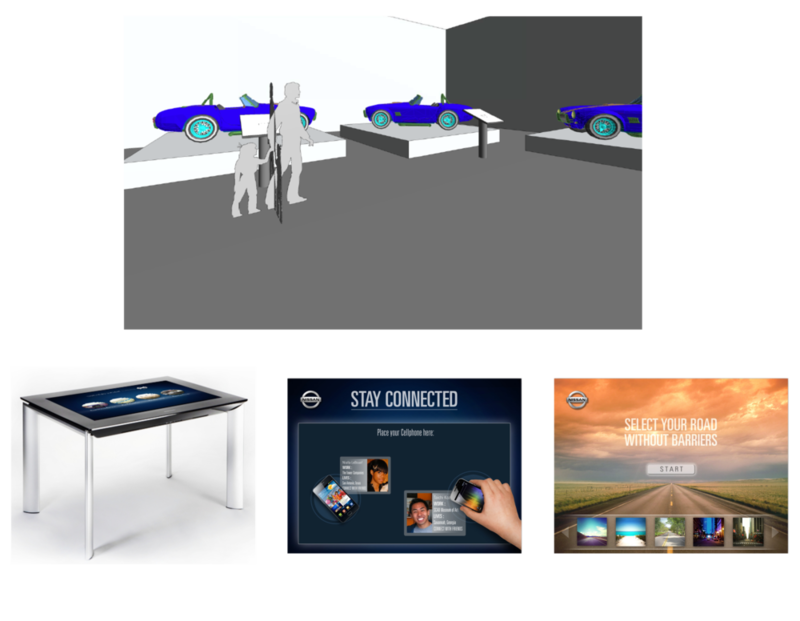 Based on this, each Nissan dealership is equipped with tablets mounted next to each model reeling a live feed of testimonials from previous satisfied buyers. To eliminate clutter and confusion, the traditional car brochure will be replaced by implementing augmented reality and the use of Goldrun technology. Users can take away the new brochures and use their smartphone to learn more about the vechile they’re most interested in buying. Augmented reality allows consumers to gain more information in a more interactive and innovative way. 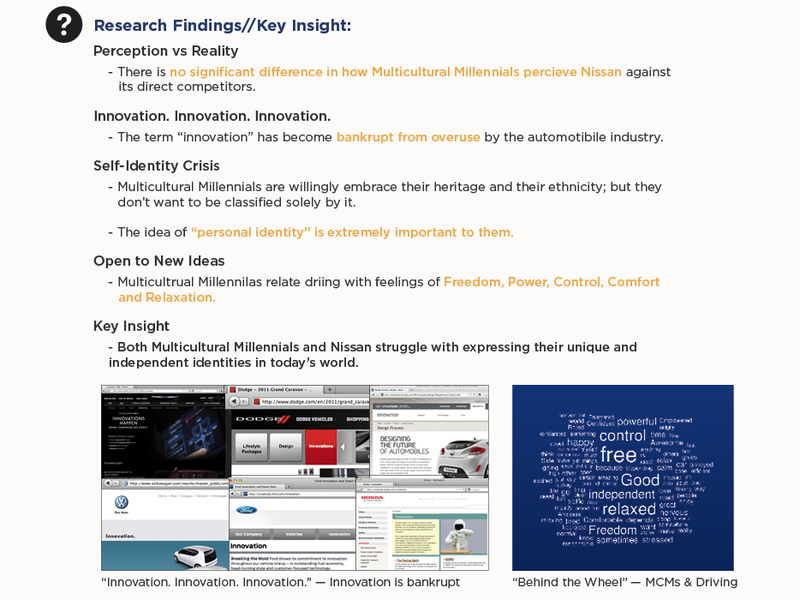 Nissan’s social media pages, including Facebook, Twitter and Google+ accounts, reflect the Nissan brand voice found throughout the IMC. Social media pages also promote other portions of the IMC including the “Showroom Without Barriers” and “Jobs Without Barriers” Programs. Credits: Rebecca Dreifuss, Melanie Fitts, Tatiana Girman, Kendall Gregory, Pablo Isaza, Taichi Kozaki, Mark Manalaysay, Ryan Middleton, Rachel Mwakule, Marissa Pierce, Katie Reeks, Shannon Ross, Emily Shaw, Mafe Sotillo Lairet, Chelsea Stonerock, Freddy Travis, Reid Warner, Richard Charlie Weston, Micheal Williamson and Rovan Yu. Special thanks to Art Novak.